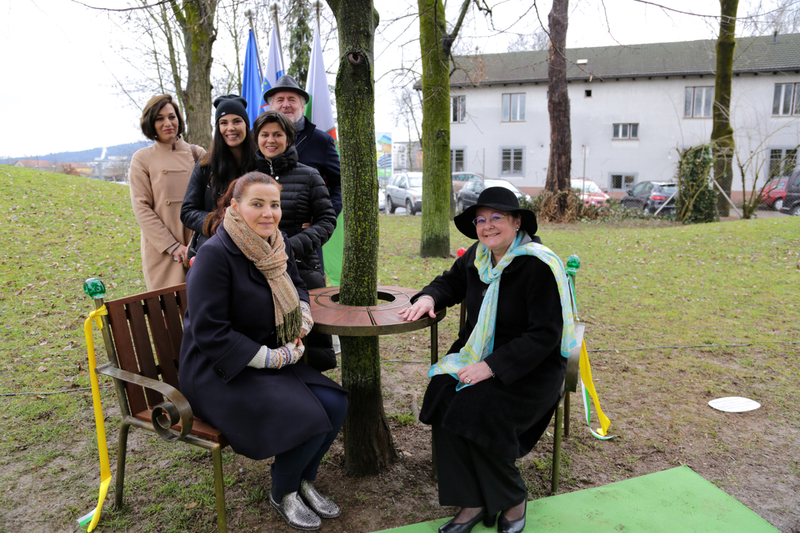 On March 16, 2018, the Havel’s Place was dedicated in Ljubljana Northern City Park, being the first one in a former communist country apart from the Czech Republic. The project was initiated by Bill Shipsey, VHLF Board member, and arranged by Ljubljana city and Amnesty International Slovenia. 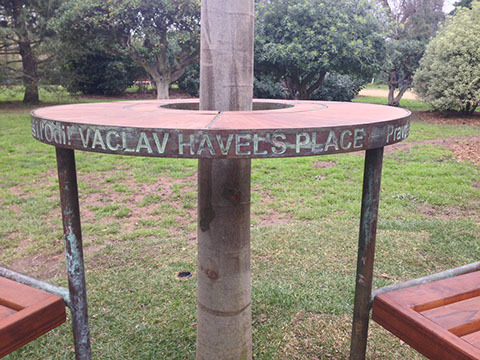 It is already the 25th Havel’s Place since the launch of the initiative in Washington, D.C., in 2013. Havel stands tall in the capital of Europe! A newly refurbished building part of the European Parliament (EP) in Strasbourg was officially opened and named after former Czechoslovak and Czech president Vaclav Havel on Wednesday, July 5, 2017. It was inaugurated by EP President Antonio Tajani and Havel’s widow Dagmar Havlova. The decision to call it after Havel was made by the EP in January 2012 on the proposal of former EP deputy president and Czech MEP Libor Roucek. Havlova pointed out that Havel addressed the EP in 1994 and in 2000. “He highly respected this international institution because it is based on the same values he himself espoused throughout his life, values for which he was fighting all his life,” Havlova said. The building marked with the abbreviation “HAV” is made special and brought to life by the marvelous works of Czech artists honoring Havel. A bronze bust by Marie Seborova is incorporated into a stone bench in front of the entrance. Twenty-five photographs by his official photographer Tomki Nemec commemorating the period after the Velvet Revolution in 1989. And the tapestry Flying Man 2 designed by Petr Sis and woven BY Aleliers Pinton decorates the main meeting room. The art works were all commissioned by Bill Shipsey, founder of Art for Amnesty and member of the VHLF Board of Directors. Most of the building will be occupied by the EP and one third will be the office of the European Ombudsman. 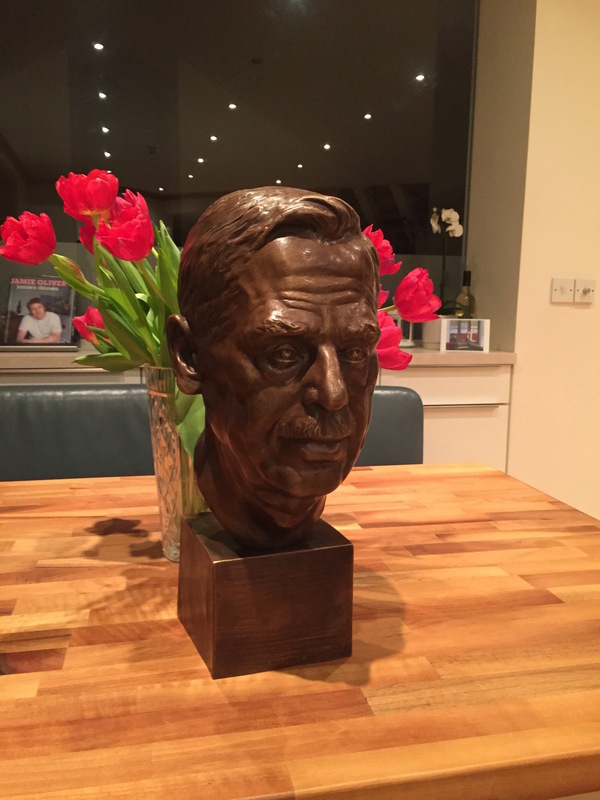 The bust of Vaclav Havel was dedicated in the Irish Parliament on June 18, 2015. 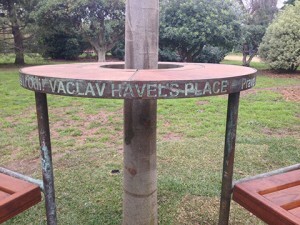 Havel is the first non-Irishman to be given this honor. The money for the bust was raised by Beta Bajgartova, a Czech photographer living in Dublin. You can watch the documentary prepared for this occasion and listen to the speeches of the Czech Ambassador to Ireland, Hana Mottlova, the Speaker of the Irish Parliament, Sean Barrett, the sculptor of the bust, Marie Seborova, and Bill Shipsey, the founder of Art for Amnesty and the initiator of this honor. This program was produced by the Houses of the Oireachtas (Parliament of Ireland) for Oireachtas TV and permission to use this by the Vaclav Havel Library Foundation was granted in 2015. The first bust of Havel was unveiled at the Council of Europe in Strasbourg on October 2, 2012. 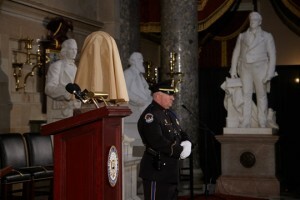 The bust, by the Czech-American sculptor Lubormir Janecka, was dedicated at the U.S. Capitol on November 19, 2014, to commemorate the 25th anniversary of the Velvet Revolution. A bust of Havel by Seborova will be dedicated in Mexico City at the Museum of Memory and Tolerance. The Palace of Westminster and the European Parliament are also considering dedicating a bust of Havel. Peter Sis, a Czech-born American artist, designed an Aubusson tapestry devoted to the memory and legacy of Vaclav Havel. It was conceived by Art for Amnesty founder Bill Shipsey on behalf of Amnesty International and supported by five world famous musicians – Bono, The Edge, Peter Gabriel, Sting and Yoko Ono Lennon. The tapestry, measuring 5 x 4.25 meters, is on display in Terminal 2 at the Vaclav Havel Airport in Prague.